Learn how to customize the look, position, and color of your website widget. Learn how to organize your data and keep track of certain topics in your helpdesk. Find out how to create your full signature and what you need to define for each signature. Discover the benefits of using our products. Learn how to create your own predefined answers, reply faster to your customers. Read about how to define your areas and keep track of certain topics in your helpdesk. Learn how to set up personal website notification(s) on your website. Let customers know on which days and at what time you’re available. Chat Widget is a faster and more personal way for your customers to get real-time support from your agents. It saves your team time and offers your customers a better experience throughout a simple and highly customizable chat widget to complement your website and taste. 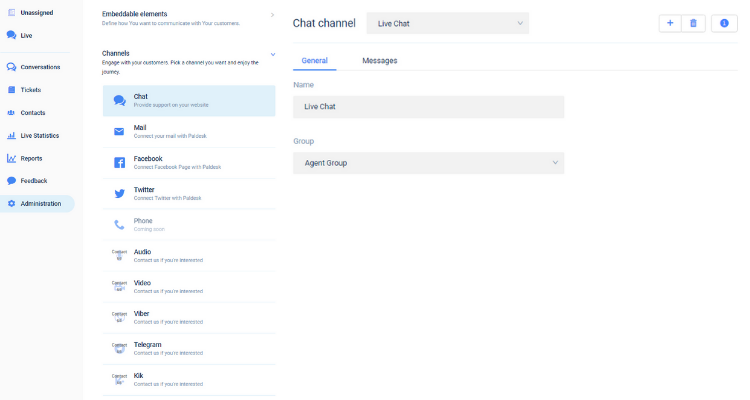 Multiple channels can be created for your different groups of agents, names for them can be customized and your messages can be personalized for the people who want to contact you for something on your website. In order to reach it, sing into Paldesk, enter the application and navigate to Administration. Next, click on Channels and there you will see Chat icon that you also click on and from there another panel on the right will open. There you can change the name of your channels or change the group that will be assigned to the desired chat channel. You can add new channels by clicking on the ‘+’ button in the upper right corner. After clicking on it you have to give it a name and assign it to the desired group for agents. After that click on Create to finish creating a new chat channel. Also, you can delete your chat channel by simply clicking on the trash can icon in the upper right corner next to the + icon and confirming your choice by clicking yes. By clicking on Messages tab you will have options to adjust your predefined messages for your website visitors. You can adjust pre-chat question that will appear to a visitor as a first message, Welcome message and Wait message if no agents are available. Also, you can exclude any of the messages from appearing to your visitors by removing the tick next to it and clicking on Save afterwards.